Sri Masilamaneeswarar Temple at Thirumullaivoyal. Thirumullaivoyal is situated at a distance of about 16 kms from the Koyambedu Bus Terminus, Chennai. It is on the Chennai to Thiruvallur route. There is a railway station in Thirumullaivayil on the Chennai to Arakkonam railway line. The temple is about 2 kms away from the station. Other Devara Paadal Petra Shiva Sthalams near this temple are – Thiruvotriyur, Thiruvalithayam, Thiruverkadu, Mylapore and Thiruvanmiyur. This is one of the 276 Devara Paadal Petra Shiva Sthalams and the 22nd Shiva Sthalam in Thondai Nadu. This lingam is not touched by human hands, not even by the priests, as it is “Theendathirumeni”. The vimanam (roof tower) of the sanctum sanctorum has been constructed according to the Gaja Brishtam style of architecture. 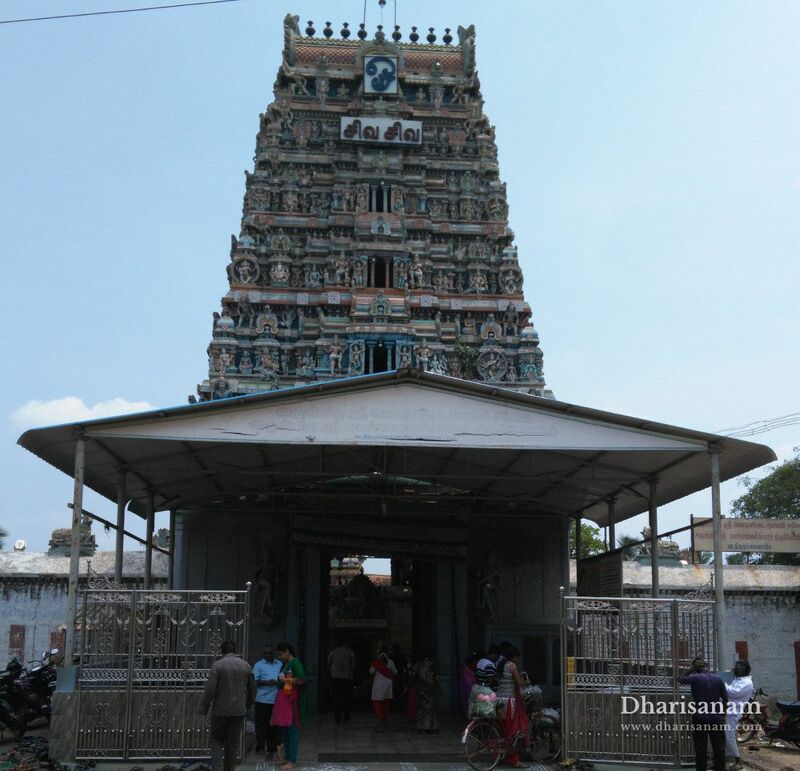 The temple’s main tower (Rajagopuram) has 5-tiers and has 2 corridors. There are two places with the same name of “Thirumullaivayil”. One is located near Sirkazhi and the other near Chennai. Both of these places are home to very ancient temples. Thirumullaivayil near Seerkazhi is called “Then Thirumullaivasal” and the one near Chennai is called “Vada Thirumullaivoyal” (“Then” meaning south and “Vada” meaning north in Tamil). “Thirumullaivoyal” or “Thirumullaivasal” gets its name from the belief that Lord Shiva emerged from a Jasmine bush in both these places. “Thiru” is a respectful prefix, “Mullai” means Jasmine and “Vassal” means place in Tamil. The historical name of the place is “Shanbakaranyam”. The “Tri-Shakti temples” – the temples for Itcha, Kriya and Gnana Shakthis are very popular and are of great significance in Hindu religion. Of these, the temple of Sri Kodiyidai Nayagi at Thirumullaivayil is considered to be the Kriya Shakti temple. Acording to legend, in ancient times, the forest surrounding Thirumullaivayil was occupied by three demons - Onan, Kanthan and Vaanan from the Kurumbar tribes. 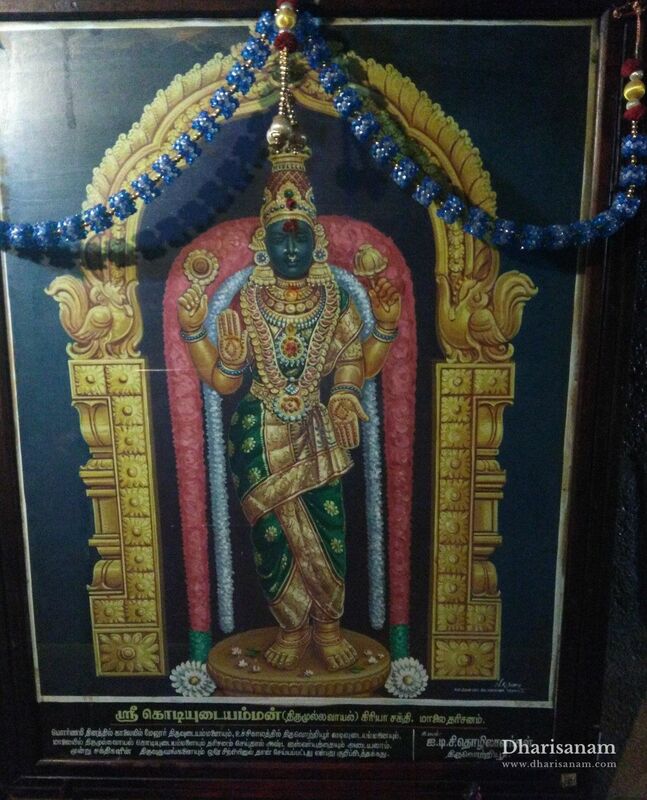 They were ruling the Puzhal region (a place in Chennai) with Lord Bairavar as their protecting deity. These demons were terrorising the common people. King Thondaiman tried to intervene but he failed in his efforts to seek a peaceful solution. Then the king went to war with them but could not succeed as these demons had Lord Bairavar protecting them. While returning from the battle field, the legs of his elephant got entangled in the jasmine shrubs. In order to clear the way, the king started hacking the plants with his sword but was shocked to see blood oozing from there. He cleared away the shrubs and found a bleeding Shivalingam there. The king was overcome by grief that he had damaged the Shivalingam. He tried to sever his head himself but Lord Shiva and Goddess Parvathi appeared before him and stopped him from doing so. Lord Shiva asked Nandhi to go with the king to counter the demons. With Nandhi’s support, the king succeeded in his second attempt and destroyed the demons. That is why the Nandhi here is facing the east direction (towards the Puzhal region) instead of looking at Lord Shiva. 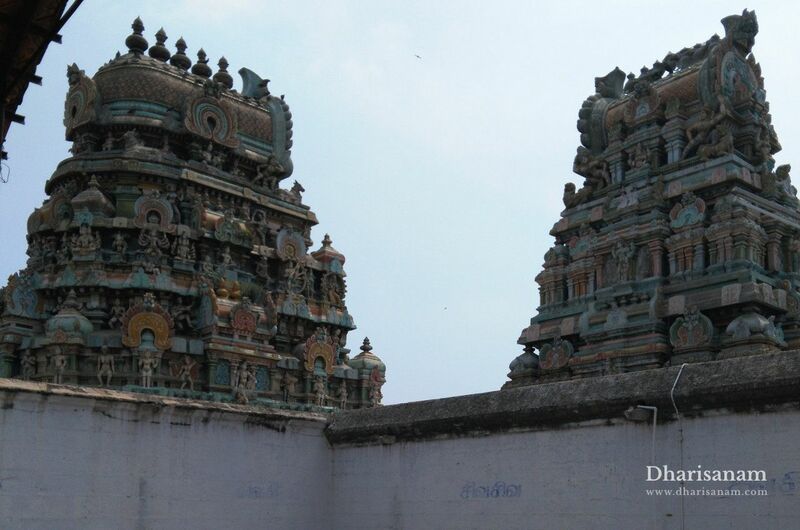 The king built a temple where he found the Shivalingam and named the lord as “Masilamaniswarar”. This can be literally translated as “the Lord who is as precious as a gem, but without any stains”. In Tamil, “Maasu” means stains, “ila” means without, “mani” means gem and “Iswar” is a respectful suffix. 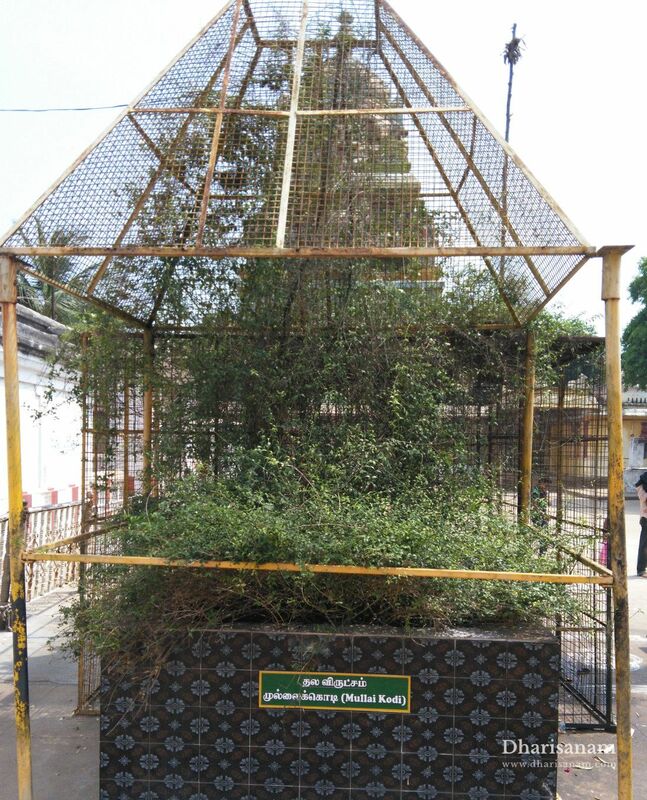 To commemorate the victory, he seized a prized possession of the Kurumbars - two pillars made from the trunk of the “Vellerukku” tree (white Crown flower – Calotropins) from their fort and installed them in front of the main deity of this temple. These pillars are 11 ft high and have a perimeter of about 2.5 ft. They can be seen even today on either sides of Lord Masilamaniswarar. The main deity is a tall Swayambumurthy lingam with a square base (Avudaiyar). This lingam bears scar marks due to the cut from the king’s sword. To hide these scars, the lingam is always covered with sandalwood paste. During the day of the Sathaya nakshatra (Aquarius) in the Tamil month of Chithirai (Apr-May) every year, the old sandal paste is removed and a fresh layer is applied. This sandalwood paste is also seen as a way to treat the wounds on the lingam. There is no abhisheham for the lingam and it is only performed on the Avudaiyar (base). It is believed that lords Mahavishnu, Brahma, Murugan, Ram, Lakshman, Krishna, Suryan, Chandran, sages Brigu, Vashistar, Soodama, Durvasar, and all the 27 Nakshatras (constellations) have worshiped the lord here and received his blessings. It is believed that sage Vashistar performed penance here and got the divine cow Kamadenu as a reward for his devotion. An interesting aside is that these demons - Onan and Kanthan had earlier installed a Shivalingam in Kancheepuram and obtained the lord’s blessings. This temple in Kancheepuram is known as “Thiru Onakanthanthali”. Apart from Lord Shiva and Goddess Parvathi’s shrines, Shrines and idols of lords Prasanna Vinayakar, Murugan, Natarajar, Pitchandavar, Mahavishnu with Sridevi and Poodevi, Dakshinamurthy, Brahma, Vishnu, Durgai, Bairavar, can be seen in the corridors. Idols of Nalvar, King Thondaiman and Neelakanda Sivachariyar can also be seen in the corridors. 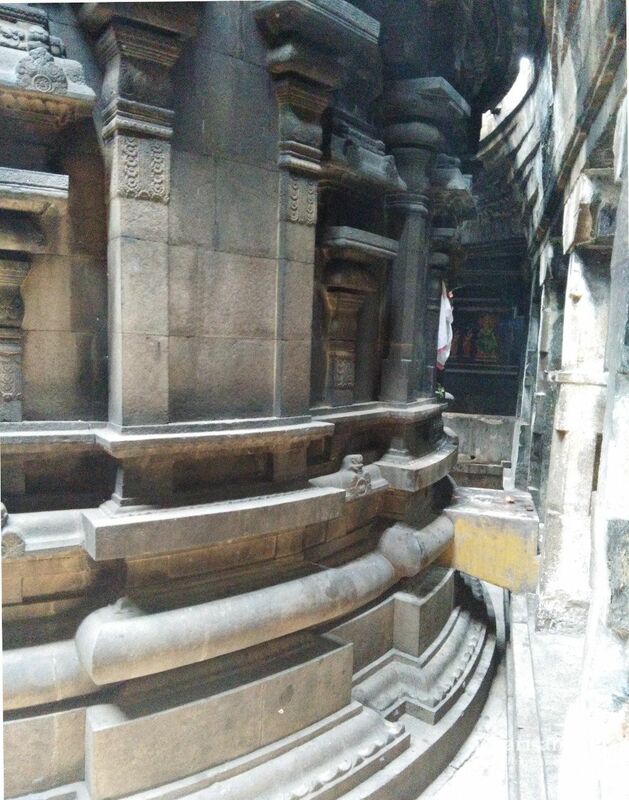 There are shrines for Sri Kusalapureeswarar and Sri Cholapureeswarar in the corridors and these lingams are believed to have been worshipped by Lauv and Kush - the sons of Lord Ram. There is also a “Rasalingam” – a lingam made out of Mercury and Silver that is kept in the sanctum. As opposed to the regular position of the shrines of Lord Shiva and Goddess Parvathi (Kodiyidai Amman), Goddess Parvathy’s shrine in this temple is on the right side of that of Lord Shiva. Secondly both these shrines are facing the east direction. This is considered to be very auspicious. The Goddess here is called “Kodiyidai Nayagi”. This can be literally translated as “goddess who has a waist as slender as a Jasmine climber”. Of the three (Icha, Kiriya and Gnana) Shaktis, Sri Kodiyidai Nayagi is considered to be the Kriya Shakti. It is believed that worshipping these three goddesses in a single day (especially on a full moon day which falls on a Friday) at morning, midday and evening rewards the devotees with manifold benefits. Devotees can visit Sri Thiruvudai Amman (Icha Shakthi) in Melur in the morning, Sri Vadivudai Amman (Gnana Shakthi) in Thiruvotriyur in the afternoon and Sri Kodiyidai Nayagi (Kriya Shakthi) in Thirumullaivayil in the evening. In a similar vein, the significance of this temple is that one can seek to obtain salvation by simply hearing about the lord of this temple. There is no shrine or idols for Navagraham in this temple as these nakshatras are believed to have worshiped Lord Shiva here. The vimana (roof tower) of the sanctum sanctorum is designed in a special style of architecture called the Gaja Brishtam. This makes the vimanam look like the rear of an elephant (Gaja - elephant, brishtam - rear). This is also known as “Thoonganai Maadam” in Tamil (thoong(um) - sleeping, aanai - elephant, maadam - top of a temple). The sanctum sanctorum is in the form of semi-circular tank (akazhi in Tamil). In his hymn of this temple, Saint Sundaramurthy sings about the King Thondaiman and how his elephant got entangled in the jasmine shrubs. Saint Madhava Shivagnana Yogi, Saint Ramalinga Adigalar and the “twin poets” (Irattai Pulavarkal) are believed to have worshiped the lord and rendered their songs. Since Goddess Kodiyidai Nayagi is considered to be the Kriya Shakti, her shrine is famous among devotees. They believe that worshiping the goddess here will bless the newlyweds with a long and prosperous married life and will remove obstacles in marriage proposals of unmarried women. 10-day Brahmotsavam in the Tamil month of Vaikasi (May-June), wedding festival on the Vaikasi Visakam day, Masi Float festival (Theppam in Tamil) in the Tamil month of Masi (Feb-Mar) and Vasantha Utsavam in the Tamil month of Aani (June-July) are the main festivals celebrated in this temple. From 06:30 AM to 12:00 Noon and from 04:00 PM to 08:00 PM. Tamil Nadu – 600 062. Tele: +91 44 2637 6151.